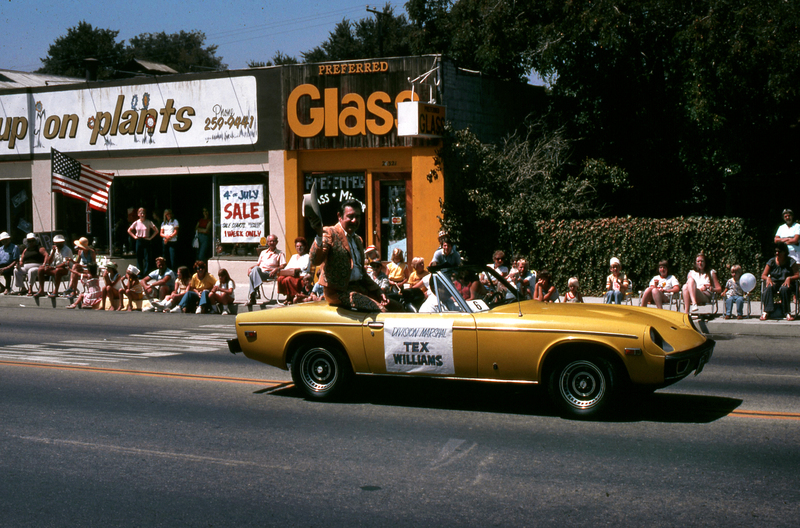 July 4, 1979 — Popular Western recording artist and Happy Valley-Newhall resident Tex Wiliams is a division marshal in downtown Newhall's 1979 Fourth of July Parade. Here, Williams (Aug. 23, 1917 – Oct. 11, 1985), who owned the onetime French Village nightclub in Newhall, is riding northbound on San Fernando Road (previously Spruce Sreet, later Main Street) in front of Preferred Glass (Preferred Glass of SCV Inc.) at 24321 San Fernando Road, on the west side of the road between Market Street and 8th Street. The building, which included Preferred Glass and its next-door neighbor, Hung Up on Plants, was later remodeled into a single, two-story office building with an address of 24325 Main Street. The driver of the car has been identified as Herb Thacker of Thacker Stationers, 24253 San Fernando Road (Main Street). Further Reading: Recollecting My Neighbor, Tex Williams by Patti Rasmussen (2006). TN7901: 19200 dpi jpeg from color transparency (slide film).